BARCELONA -- LG Electronics' newest flagship smartphone, the LG G5, is a sleek-looking metal and glass Android 6 (Marshmallow) device with an unusual new feature -- a 2800 mAh battery that slides out from the bottom. The slot can accept a variety of modules when the battery tray is removed, including one that provides enhanced camera controls and another to boost sound quality beyond what's already in the LG G5. There's even a module being developed with Parrot that can turn the G5 into a drone controller by using the phone's 5.3-in. touchscreen display, LG officials told Computerworld. The South Korean company unveiled the G5 at an event Sunday on the eve of Mobile World Congress here and said it will ship in many countries, including the U.S. in April. Pricing was not announced, and it isn't clear how the modules will be priced. Some bloggers are calling the unusual slot a "Magic Slot," but LG hasn't adopted that name. Even so, the modular design offers a potentially endless array of unusual add-ons that will be built internally at LG and by third-party developers who are being encouraged to use LG's module software. 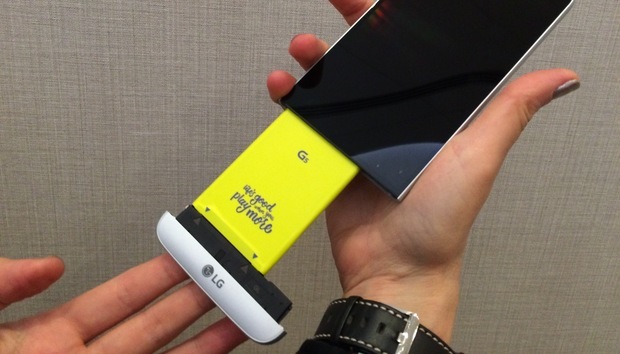 If all this sounds like LG is trying to make a smartphone that's more fun for users, it is. The modules themselves are even referred to by LG as "Friends." Woo showed a series of slides describing how users are seeking something distinct in a new phone. "Smartphones are all the same....I'll just buy the cheaper phone," one slide said, reflecting how typical buyers think. One of the more unusual fun accessories will be an LG Rolling Bot, though it won't be ready for market when the phone first appears. It doesn't require inserting a module into the battery slot; the controller software is built into the phone. As demonstrated, a G5 user can move the Bot -- a small sphere -- around on the floor wirelessly. The bot functions as a home monitoring appliance, or to entertain a dog or cat left at home. It includes a microphone and speakers. The insertable camera module, called LG Cam Plus, has hardware buttons for shutter release, zoom and flash, as well as an added 1,200 mAh of battery capacity, atop the phone's 2,800 mAh, for a total of 4,000 mAh. The sound enhancement module is called LG Hi-Fi Plus and includes high sound quality technology from Bang & Olufsen. Other G5 accessories LG announced include an LG 360 Cam, a spherical camera to capture 360-degree still shots and VR (Virtual Reality) content, as well the LG 360 VR, a stylish, light-weight virtual reality headset that Woo described as "not nerdy." The accessories are not modules that slide into the phone; they work via Bluetooth. The emphasis on smartphone as a device for play started at LG at least two years ago, said Kenneth Hong, an LG global director of communications, when LG began realizing that sales growth was slowing and that buyers needed more incentives to upgrade. "We knew this plateau in smartphone popularity was coming and the growth would someday come to a screeching halt," Hong said. "We knew if it was just a matter of more megapixels in a display, it wouldn't matter much. We're coming on 10 years since the first iPhone and that's a pretty long time. We knew we would have to change the conversation and that the discussion had to go beyond hardware. "Talking technology and specs is a fool's game," he added, stressing that LG wants to emphasize usability, flexibility and convenience. In fact, the G5 does offer conventional hardware improvements, like a faster Snapdragon 820 processor. There's also the "always-on" feature, which announced earlier. Woo said that the emphasis on play with the G5 could help the company move into the top five-ranked smartphone makers in the world. The company now has about 5% of the market, but wants to double that, Hong said.